At colleges everywhere, dumpsters are filled with used but still usable items. Desk lamps, XL sheets, comforters, rugs, laundry bags, hampers, fans, and blankets are thrown away. This is where Grad Bag comes in. They collect dorm room items before they’re thrown out, then clean, package, and store them to be re-distributed to soon-to-be college students who might not have the means to buy these things on their own. 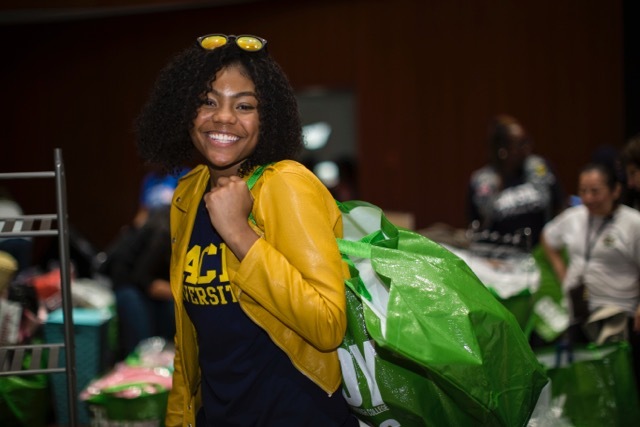 Let’s Get Ready and Grad Bag formed a partnership and hold events every year for college students who are in need of gently-used dorm supplies. This year, they have collected over 6,000 lbs. of linens in addition to lots of lamps, rugs, pillows, storage containers, fans, hangers, and much more, and will gear hundreds of students for college in the fall. For more information, visit http://www.gradbag.org/.